Through the majesty of its gothic towers and its flying suspension wires, the Brooklyn Bridge has become a symbol of national pride. 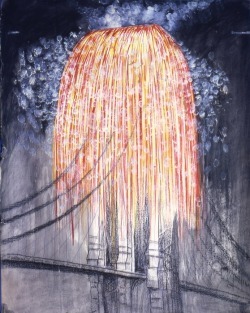 The culmination of paintings, poetry, books, and movies show the unique cultural identity of the Brooklyn Bridge. The Brooklyn Bridge's 21st century Fourth of July celebration. 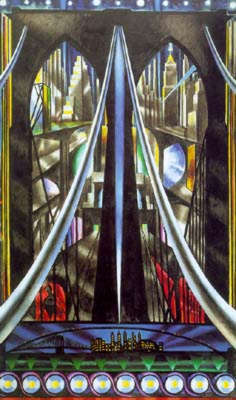 Painter Joseph Stella's modern take on the Brooklyn Bridge. 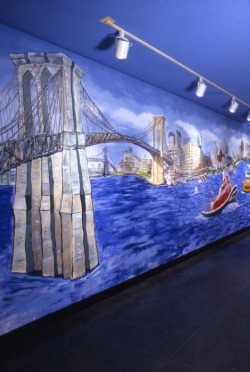 "Dame of the Narrows" by Red Grooms located in the Brooklyn Museum. 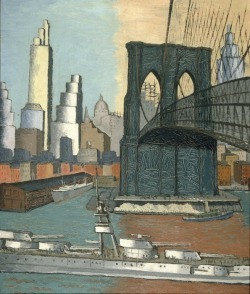 Inspired by the Brooklyn Bridge's opening, Will Carleton wrote a now famous poem describing the enthusiastic spirit of the people when Brooklyn and Manhattan were united. THE WEDDING OF THE TOWNS. Let all of the flags be seen! The banns were long delayed. And the wooing seemed for naught. Betweent them, like a sword. On May 24, 1883, Over 50, 000 people rejoiced during the opening ceremonies of the Brooklyn Bridge. 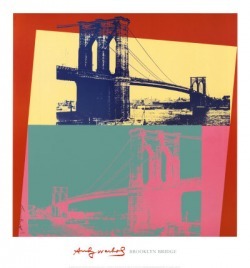 This only marked the beginning of the Brooklyn Bridge's lasting cultural impact. 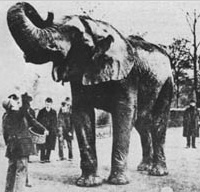 On May 17, 1884, circus showman, P. T. Barnum, led 21 elephants over the Brooklyn Bridge to prove that it was stable. 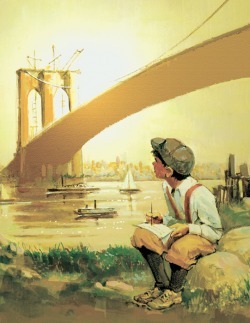 A Clip from Ken Burns' documentary entitled "The Brooklyn Bridge." In this clip various scenes from movies and television are shown that contain the Brooklyn Bridge. This depicts the broad cultural impact that the bridge has had on America. Let never a flag be hidden ! Let never a bell be dumb ! The wedding-day has come ! And gaze, with gleaming eye. How, blessed by the hand of Heaven. To add to her ancient seven. 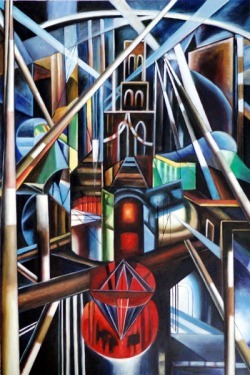 In addition to art, the Brooklyn Bridge also inspired many writers. 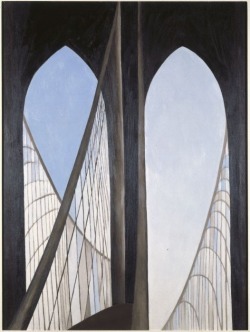 Allan Trachtenberg wrote about the bridge in his article called "Brooklyn Bridge and the Mastery of Nature" in the Massachusetts Review in 1963. He describes the cultural impact of the bridge as a symbol of "American ingenuity" and its representation of a "leap into the future."